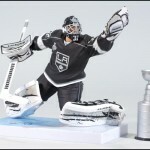 McFarlane Toys has just released photos of NHL Series 23, due out in January 2010. This series will feature some brand-new sculpts, as well as some re-paints. 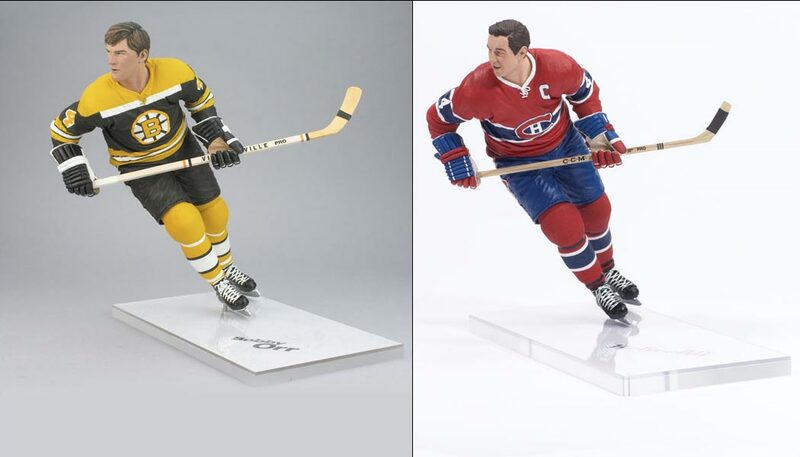 Also, it will be the first time McFarlane Toys inflicts introduces their different “Collector Level” variations on unsuspecting eager hockey fans. This figure is a repaint of Martin Brodeur 2, released in NHL Series 9 (December 2004), but of course with a different head. 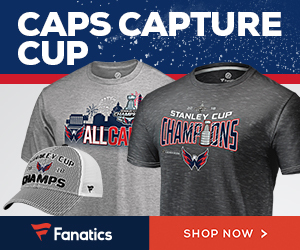 Given his team’s Stanley Cup victory last spring, a figure of Fleury makes sense. 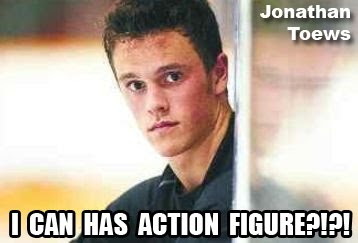 Too bad it is not an action pose, though. 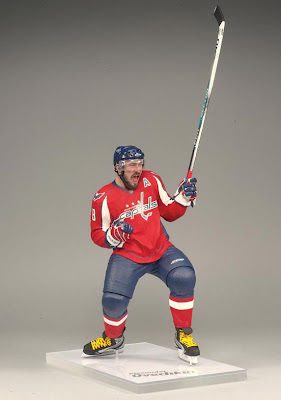 About two weeks back, I mentioned how tired I was of Alexander Ovechkin having a figure in seemingly every other SportsPick assortment. Well, I take that back. This toy looks fantastic. Ovechkin celebrates a goal; stick raised, mouth open and teeth missing. Oh, and he’s rockin’ the playoff beard too. 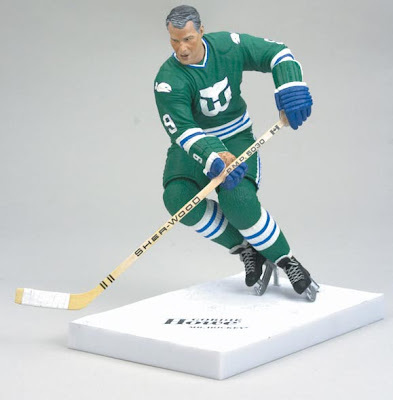 If the figure looked more like Gordie here, then it would have been a winner. Bobby! 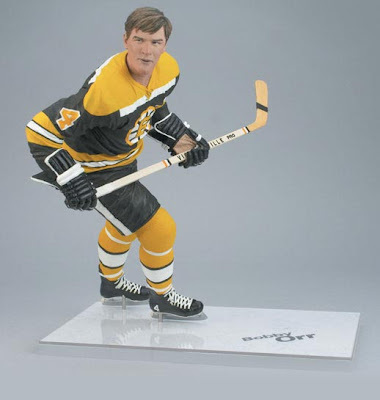 According to their website, this “Bobby Orr action figure is based on his legendary 1970 season.” But big-time figure geeks will recognize this as another repaint-with-a-new head. 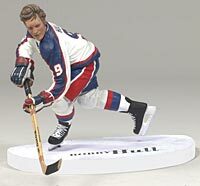 This figure was originally Jean Beliveau way back from NHL Legends Series 2 (April 2005). Orr was 6-0, and Beliveau 6-3. Close enough in height to use one figure as another. Yay! A player in a uniform from a defunct NHL team! And I’m not being sarcastic, either. Who wouldn’t want this figure? 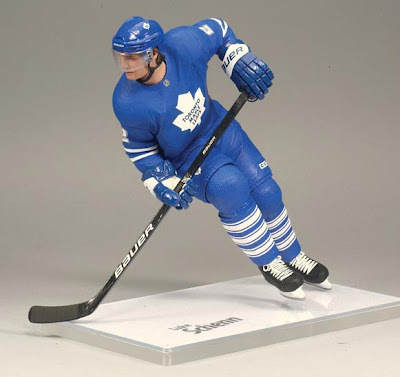 Unfortunately for old-time hockey fans and those still holding a candle for the Jets, this figure will be one of the hardest to get in this series. Which brings me to our next topic. 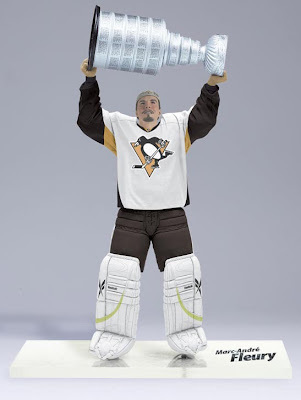 Silver – 500-1000 – Marc-Andre Fleury – Gloves and stick at his feet, base painted to look like red carpeting. 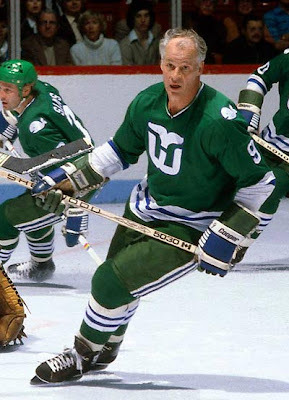 Gold – 250-500 – Gordie Howe in Green Jersey – I am not sure how this will vary from the “normal” Gordie Howe in green jersey that is part of the regular assortment. 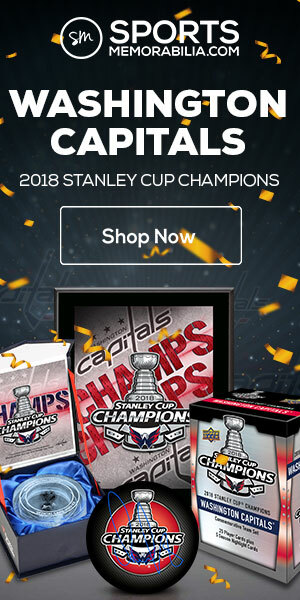 Premier – 100-250 – Alexander Ovechkin 4 in All Star Uniform. 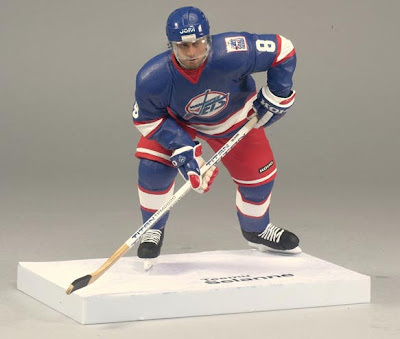 All Star – 50-100 – Teemu Selanne in Jets uniform. The “Classic Chase” figures will be of Schenn or Ovechkin in road (white) jerseys instead of the normal home jersey versions. 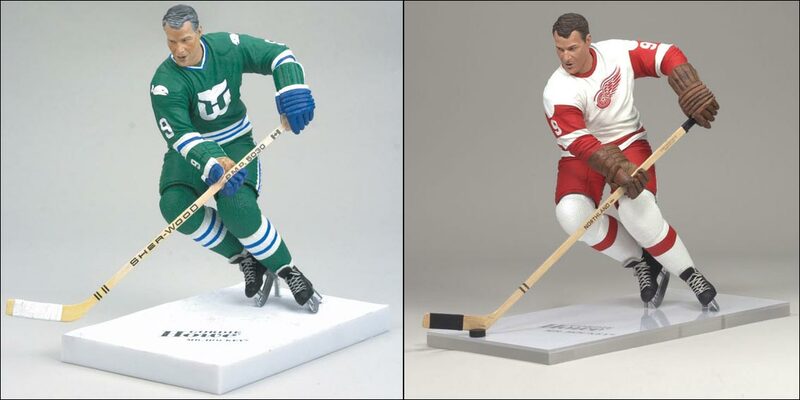 Personally, I don’t care one way or another about a figure having a signed base like the “MVP level” Gordie Howe figure mentioned above. 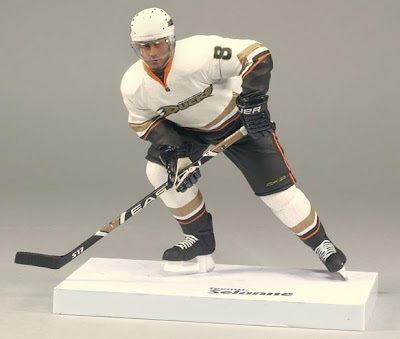 But making a major paint variation like the Jets Selanne figure super-limited will aggravate a lot of fans. Most of the time, variants are cherry-picked before they even hit the shelves at your local Toys R Us. Why go through all the trouble to entice us, when all 50 to 100–or however many end up getting produced–are whisked away by toy store managers or stock room boys before you or I have a chance to get one? 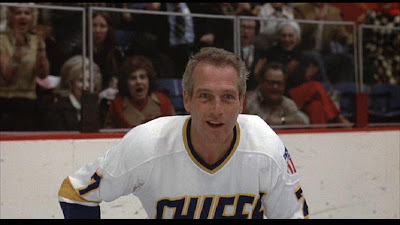 You know that you are not going to just walk into a Wal-mart and find a Gordie Howe with signed base figure just sitting on the shelf, waiting for you. In other words, buy a sealed case and you will either get a Classic Chase (boo) or a “Collector Level” (yay) figure. UPDATE: Where are my manners? 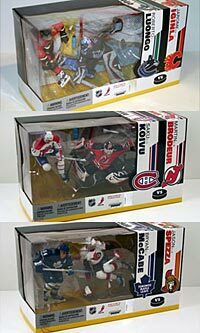 I was so irate about the predicted rarity of the Selanne-as-a-Jet figure that I forgot to link to McFarlane Toys article about NHL Series 23. Photos are courtesy of McFarlane Toys. Huh, very disappointed in the Howe figure. The nicest one there is the Selanne which I'm sure I'll never stumble across. If McFarlane wants to do variant bases, or have some that come autographed, etc. that is fine. 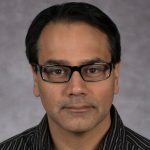 But to make a completely different uniform be the variant–especially one that people feel so strongly about like the Winnipeg jets–is a bad move on their part. 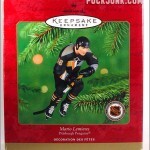 Actually I did happen to walk into a Walmart and find a gordie howe mvp on the shelf. A lady found a Bobby Orr white Jersey while I was celebrating!